These are glass ornaments I bought for 50% off at my local Michael’s store. I poured in Diamond Dust and Glamour Dust into the bottom. Use a coffee filter as the funnel, it captures the smaller glitter and helps keep down on the mess. Then cut out 2 1/2″ circles from Acetate or Transparencies. Stamp image onto plastic using staz on ink. Hit for a couple of seconds with a heat gun. Now, color the image with Sharpie markers or paint pens, also heat setting for a few seconds. Above you see what was left of a bradford pear tree in our front yard. Unfortunately the tree could not be saved and had to be professionally removed. 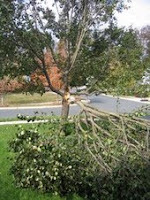 The tree service was very professional and came out and had the tree down, cleaned up and even raked the front yard all in about 40 minutes. The saddest part was seeing and knowing that about 3 birds nests were also destroyed. We have neighbors with fire places and the service was nice enough to cut up the larger pieces so they can have the wood. Hopefully in the spring we will have the stump removed and redo the existing flower bed as well as plant a new (hopefully stronger) tree. My eyes filled with tears as the last of the tree was removed. The front of our home looks well — so barren. I am so blessed and thankful that the tree wasn’t any taller. If that had been the case the roof, siding or even bedroom windows would have been damaged or destroyed. If the tree had landed any other place in the yard, it would have damaged our cars, the mailbox or even the brand new walk way to the front door. I’ve Been Published — So excited!! This getting published thing never ever gets old. I am so thrilled. I am published in the November/December 2007 issue of the Rubber Stamper magazine. If you do not know this already, this is the last issue of the magazine. They have been sold to another company. It is an acrylic tag on page 19. All images Sparkle N Sprinkle. 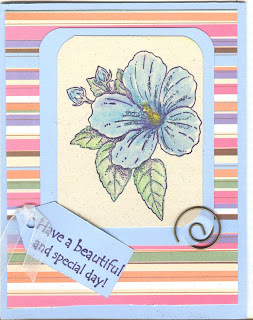 I am a designer for the folks, so check out their websight at www.sparklensprinkle.com for great stamps and accessories. I love their glitter and embossing powders. I am also published in the November 2007 of Scrap and Stamp arts, it is on page 43, it is a card I used sizzix dies to create. Here is a great project for you to try. First go to http://www.mirkwooddesigns.com/ and download the card folio templete. 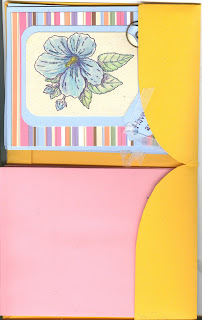 Then make the folio and matching cards. Here is one of my creations. I spent this day with a dear friend Barbara. We had such a nice time chatting and making these card folio’s. They would make a great gift regardless of the time of year. Ever wanted to make beautiful home decor’, gifts, scrapbooks or even your own cardes? The first class will be November 5 from 1:00 pm until 3:30 pm. We will be making 4 coasters, A fall greeting card. All projects are make-and-take. Cost will be $18.00. All supplies and materials are provided. To join this class, please email me at ms.rhetta@verizon.net or you may call me at 301-490-1719. I am a professional Rubber Stamper and have been published in nationally acclaimed magazines several times this year. Check out my blog at msrhetta.blogspot.com or you may visit my picture trail sight at www.picturetrail.com/ms.rhetta. Space is limited to 10 students and will fill up quickly. I will also be offering Sunday after noon classes soon. I look forward to meeting you and to teach you some new and exciting things.